This mod will simply enable the debug menu built into the base game. It can be found in the Tools & Reports section of the main toolbar. 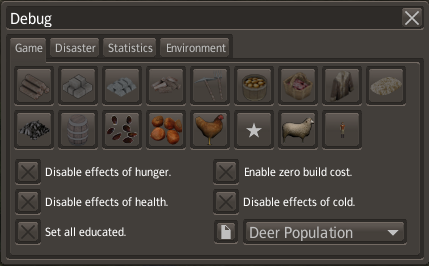 The Debug Menu will allow you to build freely, as well as add resources, citizens, change time of year, change the color of fog and lighting, cause disasters etc. I do not recommend touching the time/season sliders, as it can break the game.